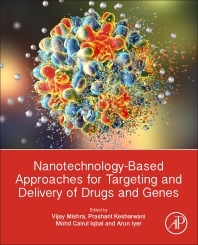 Nanotechnology-Based Approaches for Targeting and Delivery of Drugs and Genes provides an overview of the important aspects of nanomedicine in order to illustrate how to design and develop novel and effective drug delivery systems using nanotechnology. The book is organized into three sections, beginning with an introduction to nanomedicine and its associated issues. Section two discusses the latest technologies in nanomedicine, while the third section covers future developments and challenges in the field. By focusing on the design, synthesis, and application of a variety of nanocarriers in drug and gene delivery, this book provides pharmaceutical and materials science students, professors, clinical researchers, and industry scientists with a valuable resource aimed at tackling the challenges of delivering drugs and genes in a more targeted manner. Dr. Vijay Mishra is an Assistant Professor of Pharmaceutical Sciences at Department of Pharmaceutics, Lovely Institute of Technology (Pharmacy), Lovely Professional University in Phagwara, (Punjab), India. Dr. Mishra earned his doctoral degree in pharmaceutical sciences from Department of Pharmaceutical Sciences, Dr. H.S. Gour Central University, (MP), India. He was the recipient of an AICTE Graduate Research Fellowship and UGC-BSR Senior Research Fellowship. He has co-authored more than 26 international publications in reputed journals, two international book chapters and one book on pharmaceutical dosage forms. His current research interests encompass surface-engineered dendrimers, carbon nanotubes, quantum dots, siRNA delivery as well as controlled and novel drug delivery systems. Dr. Prashant Kesharwani is currently working as Assistant Professor, Department of Pharmaceutics, School of Pharmaceutical Education and Research, Jamia Hamdard, New Delhi, India. He received his doctoral degree in Pharmaceutical Sciences from the Dr H.S. Gour University (Sagar, India) with Prof N.K Jain’s group. He is a recipient of several internationally acclaimed awards viz “Ramanujan Fellowship, DST, India-2017”, “Excellence Research Award-2014”, “Young Innovator Award (Gold medal)-2012”, “International Travel Award/Grant from DST (New Delhi), and INSA (CCSTDS, Chennai)-2012”. He has received ICMR Senior Research Fellowship (in PhD) and AICTE Junior Research Fellowship (in M. Pharm.). After his doctorate, he worked as postdoctoral fellows in the Wayne State University, Detroit (Michigan, USA). Dr. Kesharwani subsequently joined the School of Pharmacy, International Medical University (Malaysia) as lecturer in Pharmaceutical Technology. Subsequently he joined Central Drug Research Institute (CDRI), Lucknow as Ramanujan Fellow. An overarching goal of his current research is the development of nano-engineered drug delivery systems for cancer through with prime focus on dendrimer and polymeric nanomicelles mediated drug delivery systems. Dr. Kesharwani is a co-author on more than 120 publications in high impact factor international journals and 4 international books with total citations of more than 3300 (h index is 27 and i-10 index is 65 as per Google Scholar). Dr. Mohd Cairul Iqbal Mohd Amin is a Professor of Pharmaceutics in the Faculty of Pharmacy, Universiti Kebangsaan Malaysia (UKM) in Kuala Lumpur, Malaysia. He is the youngest professor appointed in the faculty and the only expert in the area of pharmaceutics in UKM. He earned his BSc (Hons) in Pharmacy in 1996 and PhD in 2001 both from the University of Manchester, United Kingdom. He is currently the Head of Drug Delivery and Novel Targeting Research Group in UKM. He also serves as panel expert in nanocellulose for drug delivery for the National Nanotechnology Centre, Ministry of Science, Technology and Innovation, Malaysia. His current research interests encompass responsive-hydrogel biomaterials for oral protein and peptide delivery, cell delivery in tissue engineering and nano drug delivery systems in particular polymeric micellar conjugates for cancer research. Dr. Amin has authored more than 60 publications in high impact factor journals, a number of book chapters, has five patents issued/pending and has routinely consulted in the area of drug delivery and pharmaceutical technology. He has wide expertise in biomaterials, nanomedicine, polymer chemistry, micro- and nanotargeting delivery systems as well as oral and transdermal formulations and delivery systems. Dr. Iyer is an Assistant Professor of Pharmaceutical Sciences and Director of Use-inspired Biomaterials and Integrated Nano Delivery (U-BiND) Systems Laboratory at Wayne State University in Detroit, Michigan, USA. He also serves as a Scientific Member of the Molecular Therapeutics (MT) Program at the Barbara Ann Karmanos Cancer Institute in Detroit, Michigan, USA. Dr. Iyer received his PhD in 2008 in Polymer Engineering, under the mentorship of world renowned scientist, Prof. Hiroshi Maeda at Sojo University in Kumamoto, Japan. He was the recipient of the Controlled Release Society’s (CRS) T. Nagai Research Achievement Award in 2012. Dr. Iyer completed his postdoctoral training in Cancer Radiology at the University of California, San Francisco (UCSF) in California, USA and trained as an Associate Research Scientist and Research Assistant Professor in Pharmaceutical Sciences at Northeastern University in Boston, Massachusetts, USA. Dr. Iyer has authored more than 70 publications in peer reviewed International Journals and books of high repute. He has more than 100 scientific presentations and invited talks at International Conferences and Workshops. He has five patents issued/pending. His areas of research are broadly focused on designing use-inspired bio- and nano-medical technologies aimed towards clinical translation using biocompatible delivery systems that have enhanced disease targeting with reduced toxicity burden to patients. He has wide expertise in biomaterials and nanomedicine, polymer chemistry and formulation development, drug and gene delivery systems, molecular and functional imaging, micro and nanoparticles for treating diseases such as infection, inflammation and cancer. His laboratory is funded by agencies such as National Institutes of Health (NIH), Wayne State University and other private and non-profit organizations.